On September 1, 2017, the remnants of Hurricane Harvey were passing through central North Carolina after devastating Texas and blew the transformer out on my property a few acres away from my house. So, we went out for a drive. We are near the new development of Chatham Park and I drove by that, got something to eat, walked around a few stores and were just out looking for the unknown when we found it. 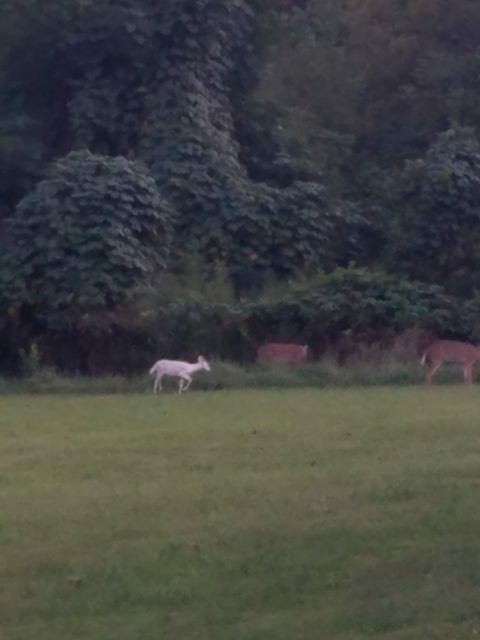 My wife spotted an albino deer, or more likely a piebald deer, not sure which but it was indeed a solid white whitetail deer fawn. I quickly turned the truck around and stopped in the median of the road to get a cell phone pic and we saw a solid black deer. My wife saw it first and I told her there are no such thing as black deer. I was wrong. There was a freaking black deer there. I squinted and thought that it was just a shadow, then I thought it was a goat, then a black dog, then it moved and was eating grass, then it nibbled on the tree above it and followed along with mom and the albino. I couldn’t believe it. A BLACK WHITETAIL DEER! I Googled it and the first thing I found was a Snopes article informing me that I am not crazy. The black whitetail deer is called a melanistic or melanic deer. According to North American Whitetail, “their bodies produce far too much of the hair, skin and retina pigment known as melanin”. Is this the only black deer in North Carolina? North Carolina Wildlife Resources Commission confirmed with me September 19, 2017 that their deer biologist, who has been with them for over 2 years, has never had a report of a melanistic deer in North Carolina. 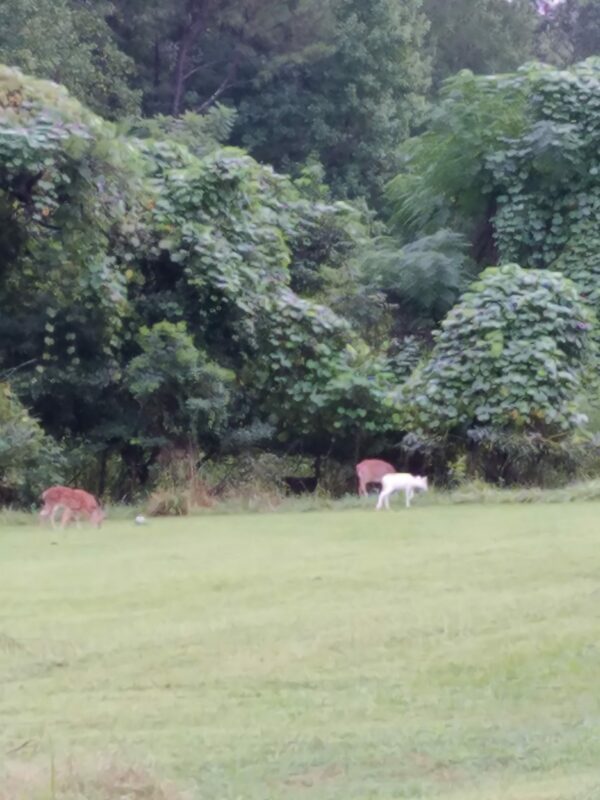 Did the mom have a black deer and a white deer? Are they twins or are these fawns from 2 separate mothers? 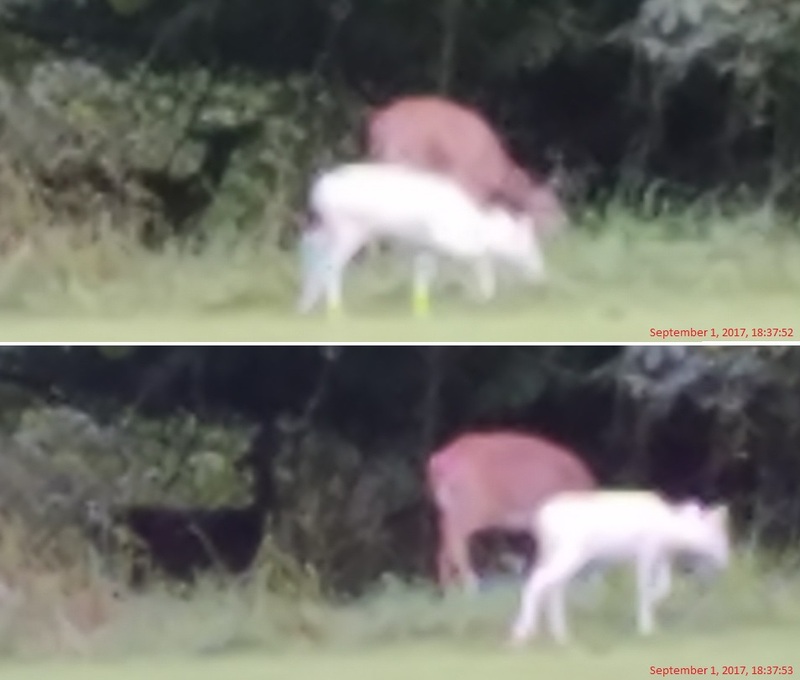 Does the same gene create both melanistic and piebald or albino deer? Unknown. Researchers do not know the answers to this question. Is this the only picture in the world containing both a black and a white deer? It could be. I scoured the Internet and this is the only picture I could find. Please feel free to use these images, just be sure to reference this article as your source. I want everyone to see these images. Sorry in advance that these pictures aren’t perfect, we did the best we could with a Samsung Galaxy S7 zoomed in from a roadway before the black deer disappeared back into the woods. 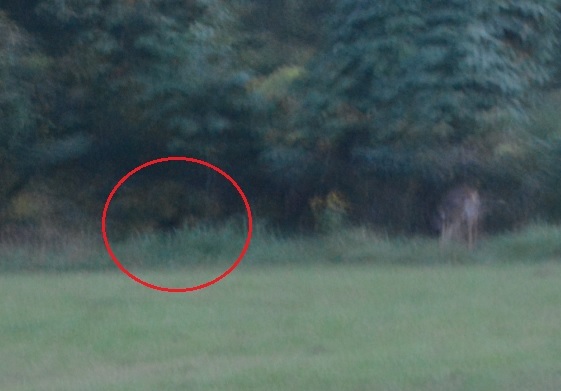 I have been searching for this deer again daily and yes I have a high resolution camera in my vehicle now. Click them to enlarge them. Update, December 6, 2017: I almost forgot to post this article to the web. This article is going live now. Deer hunting season in Chatham County is underway and apparently nobody has shot the deer yet as I’ve heard absolutely nothing about it. Have you ever seen a black whitetail deer? After reading online about various animals which can be melanistic I discovered that black panthers are actually melanistic panthers (thanks Wikipedia). So it does happen with all sorts of mammals, it is just very very very rare for deer to be melanistic. If you have seen a melanistic deer or an albino deer or any other strange deer, please feel free to chime in below. Where was this deer located? I have seen the white one before! I believe the deer likely currently resides on a large acreage tract of land owned by Habitat for Humanity. He/she should be safe back there for now.. Awesome pics, I’ve seen 1 albino deer in Greensboro on I-40 4 years ago. Never seen a black one. A black one was killed near Seamster Road in Caswell County around 1980. I didn’t see it, but my grandfather did. It was solid black. He had never heard of one, so initially they thought it was a goat cross breed! My son and I had one run in front of our Jeep with several other deer last week. We at first thought it to be a large black dog so we stopped to see and it was a black or very, very dark deer with several other deer. We live in a wooded area called Dave’s Mountain between Randleman and Asheboro NC. I had never seen one but wasn’t for sure if they were rare. I wish I had taken a pic now. Can’t get a good picture of the melanistic deers but the are bedded down on our ridge. I don’t want to give my location because I don’t want anyone harming them. 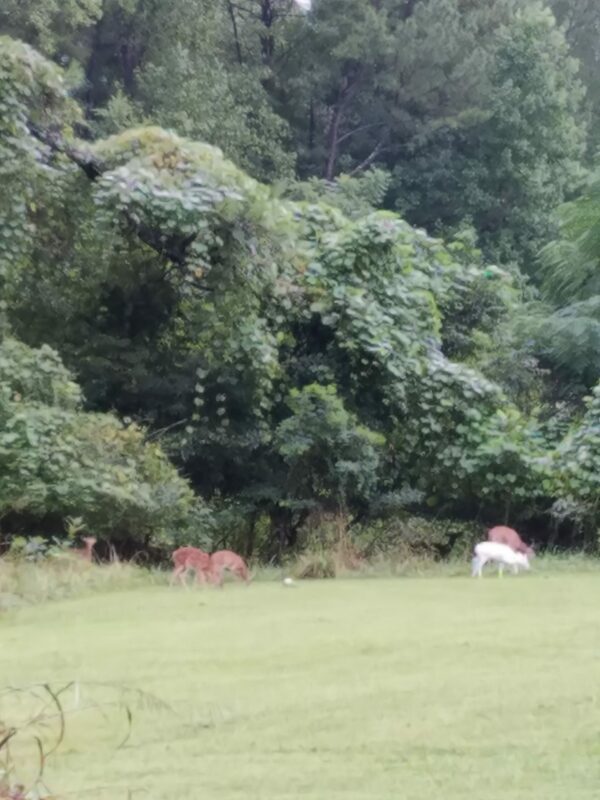 My parents live in Halifax county NC and spotted a white deer and a black deer yesterday (March 14th) afternoon. We just spotted a black deer Friday in Orangeville Ontario, full grown doe running through the countryside, we witnessed it from our train, we are a freight crew on a shortline railway, it was an incredible sight! Thanks for your reports about a black deer. Now at least we may not be seeing things! On 9/23/2018 we saw 2 black deers with definite white tails. It was just getting dark around 8:00PM as we drove onto our 70 acre property in Turtletown, TN. We are very rural but have lots of regular deer on our farm. The black deer were seen right at our 4 season creek. At first, since they were black, we thought they were just very large dogs. But we have never seen two large black dogs on our farm before. I said they looked like deers but my husband said that was not possible as there aren’t any black deers. (I just love it when men are wrong!). We didn’t even think about taking a cell photo and not sure would show up in limited light anyway. We are located about 2 miles from North Carolina in the Cherokee National Forest so we were excited to hear of the other NC sighting. Black Deer in Tennessee! Yup, I said there were no black deer too :). There are indeed black whitetail deer. Apparently it can happen to most mammals. Jaguars, Guinea Pigs, etc. There are even melanistic chickens! Please put up a deer camera or something, if you get a picture I’ll be happy to post it for you! I saw a solid dark black deer with two other deer crossing a street between woods on both sides, the deer was beautiful and stood out! I saw it in Pleasant Garden N.C.- It happened so quickly that I couldn’t get my cell phone out to take a picture.